What are the Fortnite week 5 challenges? Here are the latest Fortnite challenges and how to complete them, to help you earn those sweet, sweet Battle Stars (and that nice bonus XP, too). We’re now at the Fortnite Season 5 halfway point, so this should all be more or less routine at this point. As usual, there are three free challenges that anyone can complete, as well as four Battle Pass challenges that you can only access if you’ve bought into Epic’s cosmetic system. There are, of course, still four normal challenges and three ‘hard’ challenges for you to get your teeth into. The Fortnite season 5 week 5 challenges should drop tomorrow afternoon for Europe, or earlier in the day if you’re based in the US. If you’re behind on the previous weeks’ challenges, you can check out the Fortnite week 2 challenges, Fortnite week 3 challenges, and Fortnite week 4 challenges. Even if you have completed them, you might also be interested in the whereabouts of the Fortnite Road Trip Battle Stars. Junk Junction is your chest spot this week. Drop towards the NW corner of the map to gather the seven chests to complete this challenge – remember that the two chests that can spawn in the llama to the north that will also count for your total. You’ll need to drop through three portals to complete this challenges. They’re easiest to find around the desert area – particularly Paradise Palms and the surrounding areas – and the viking village east of Snobby Shores, but you can also find them near any of the Easter Island heads scattered around the island. This is a bit of a tough one. You’ll need to eliminate three opponents in the same match to complete it. There’s no specific hints I can offer though – grab a gun and start shooting. This is a slightly easier version of the previous challenge, but instead of having to eliminate opponents, you’ll simply need to deal damage, making this version quite a bit easier – you can simply increase your total over time, even if you don’t eliminate your opponents outright. 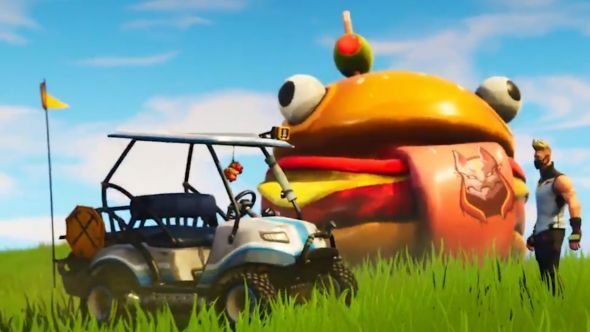 Obviously, you’ll need to head to Lazy Links to complete this challenge. Once there, head to any tee (between the two yellow balls) and use the golf ball emote to hit a ball to the corresponding green (the area immediately around the flag). You’ll need to do so five times on different holes to complete this challenge. Check the link above for a few quick tips to improve your game. This week’s map points pretty clearly towards Haunted Hills. The Snobby Shores treasure map points towards the building north of the church, so check there for your new battle star – we’ll update this story with the exact location when we know more. Shifty Shafts is your kill zone this week. You can drop for the mines themselves, of course, but remember that there’s plenty of loot in the houses across the way as well. Also, for some extra longevity, keep an eye out for the mushrooms that can be found dotted around the area.